The Box Canyon may be the hot spot this weekend. We have spotted a handful of adult salmon flies up near the dam and if it warms up just a bit I think the box might just be the spot! Keep in mind that flow coming out of Island Park reservoir is 650 cfs. It will likely remain steady near this level for most of the upcoming week. After that it is hard to predict. The runoff is over so outflow should match inflow. If storage water is not required for irrigation the water will stay low. In the event that it gets dry with above normal temperatures the flow will likely increase. We promise to keep you up to date. I would have rubber legs in #6 and #8, in both black and brown. I would also have a handful of Henrys Fork foam stones in #6 and #8. I would also have a good bunch of streamers on hand, Mike’s wool head sculpin in olive and tan, and Lil Kim’s in both silver and gold just to name a few. The flat water between the log jam on up to the Last Chance boat ramp has also been fishing well. I would have Mikes Tan E-Z Caddis in #16 and #18 an assortment of beetles from #10 to #18. Also Spent Partridge Caddis in #16 and #18 is a great fly to have in your assortment. We have also still been catching trout when larger March Brown mayflies are on the water. You can use a Parachute Adams to match this large mayfly. 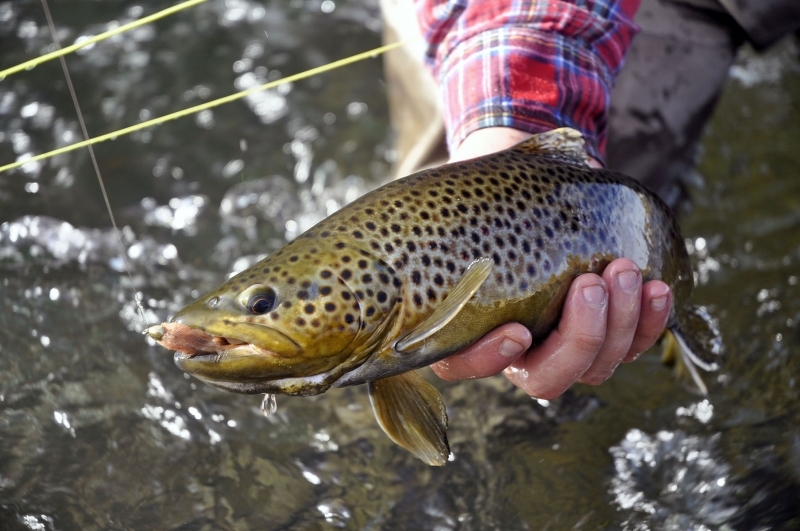 Fishing from Riverside Campground down to Hatchery Ford has also been very good. If you have never floated this section I would go with somebody who has. This is a very technical row and it seems every year someone loses a boat in this section. Henrys Fork foam stones with a black or brown rubberlegs or #16 pheasant tail will keep you plenty busy in this section of the river. Cardiac Canyon is also fishing very well with the above mentioned patterns. Keep in mind you can only take rubber boats down the slide. It’s also a spot where if you have never floated it to go with someone who has. We have experienced guides with heavy duty rafts for this purpose. Warm River to Ashton is fishing very well. Keep a sharp eye out for salmonflies but I would also watch for trout eating caddis as well as March Browns. I would also watch for golden stones to make an appearance very soon. Ora on down to Chester has also been fishing very good. Plan on seeing caddis, March Browns and a few salmonflies. Keep in mind this section of river will be very busy this weekend so be patient and stay safe. If you follow our face book page then you may have already seen the monster that Bob Lamm found in the Teton earlier this week. A 27 inch Hybrid! What a pig! While the Teton may be a bit high and off color this is a great alterative on a busy weekend. You probably will not see a lot of people on the river and you just may find your own trout of a life time! I would have streamers if I were headed to the Teton. Lil Kim’s in gold and silver, I would have sparkle minnows in both yellow and black. I also really like Zonkers on the Teton, copper and crystal are my favorite colors. 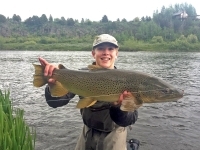 The South Fork has really fished great all through the spring. While we have not found much in the way of dry flies, the nymphing and streamer bite has been very productive. Try a #8 brown rubberlegs with a #16 silver lighting bug. I like to fish streamers this time of the year on the South Fork. A #2 yellow articulated hippy stomper fished off the drops and through the riffles can be deadly on the South Fork this time of the year. I would start looking for yellow sallies to make an appearance shortly! Flows have held steady at 11900 cfs for quite a while, I think that’s a great level for the South Fork. At that flow there is plenty of exposed gravel and riffles to fish. 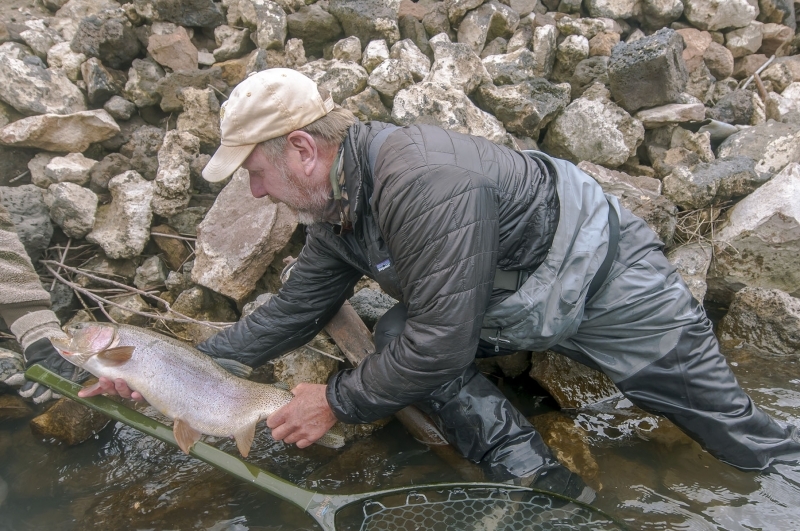 Go take a look at the tributaries that feed the South Fork this time of the year and while they are closed to fishing drive to one of the spawning weirs and you will see them staked with native cutthroats trying to spawn. If you’re lucky the fish and game will be there sorting through Cutties and rainbows they always like help so ask what you can do and I bet they will put you to work! It’s a neat thing to see. 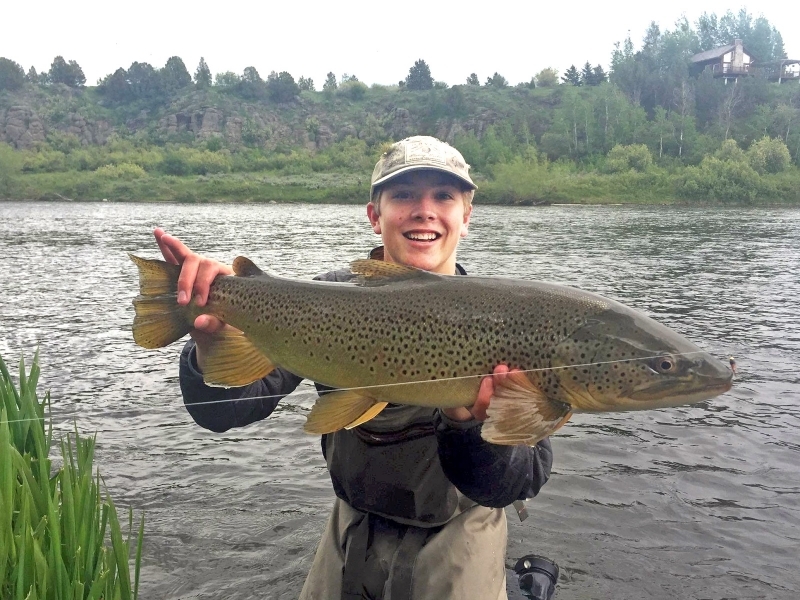 The fishing on the Upper Madison has been exceptional over the last week, and you will be hard-pressed to beat the nymph and streamer fishing that is taking place on the upper 12 miles right now. Visibility is still around 20″-24″and the river is running at a murky green above the West Fork. Once you get to Lyon’s Bridge, the West Fork is still putting in a pretty sizable stripe of brown mud on the left side of the river, which seems to be mixing somewhere between Windy and Palisades. Downstream from Palisades expect to encounter 10″-12″ of visibility all the way down towards Ennis. 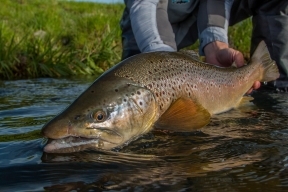 The nymph fishing is still good in the float section, but you might want to consider doing a shorter float where you can hop out of the boat and isolate water, as it can be tough for fish to find your flies in dirty water with just one pass through. Pat’s Rubberlegs, San Juan worms, and Zonkers have all been good lead flies for fishing on the run, and some of our better droppers have been caddis larva, lightning bugs, and princes. Henrys Lake is sure to be busy but the fishing should be great! I would have a well stalked fly box to hit the lake with. Jolly Ranchers and Thin Mints are very effective in Henrys Lake. I also really like Semi Seal Buggers in a verity of colors. Don’t forget to have a selection of bead head nymphs. Pheasant Tails and Prince Nymphs just to name a few. We have really beefed up our lake selection this year so come take a look! Much of the runoff in the Park is over. That means rivers like the Madison and Gibbon, which normally don’t get going until later in June should be worth a look. 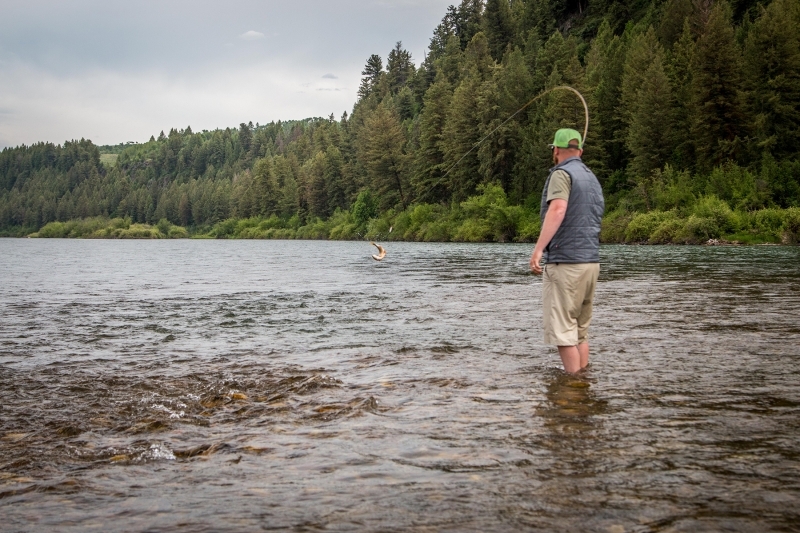 As always, the prime fishing in the Park will be the Firehole River. You’ll likely see decent hatches of Pale Morning Dun and Blue Winged Olive mayflies as well as a smattering of caddisflies. You can also get fish by swinging a soft hackle through the riffles. Streamers can also be very effective. The fishing in the area this year has been nothing short of amazing! I think the best is yet to come. 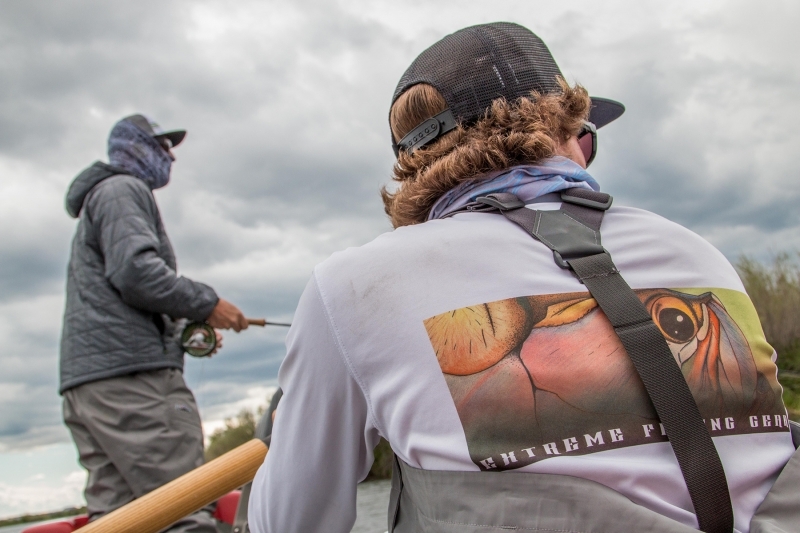 Stop in the fly shop and take advantage of some amazing deals on last year’s stock and have a look at some of the new things we have in the shop. No matter where you come from this weekend take a look around and be very thankful for such an amazing resource. We are very lucky to have what we have here. Slow down a little as the roads and the river will be crowded. Enjoy your weekend and keep close touch on our website.